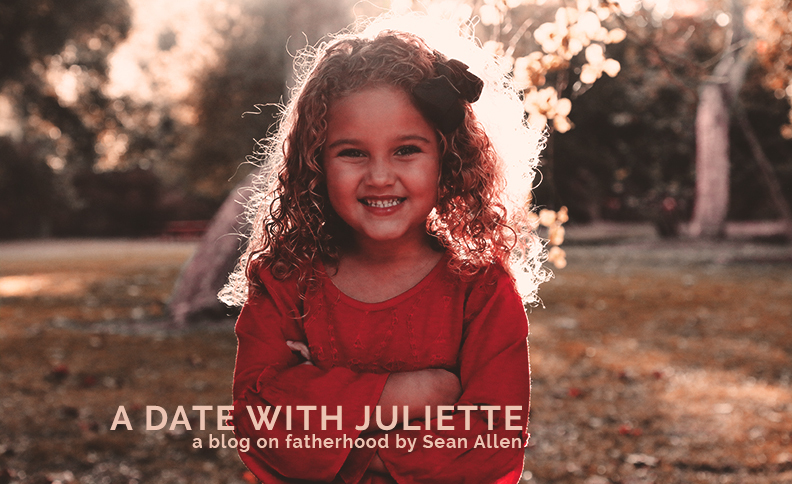 Last week I took my five-year-old daughter Juliette on a date to our local coffee shop as it was her turn for a one-on-one daddy date. She ordered a big peanut butter cookie, and we sat enjoying each other's company. A few minutes into our date she had to go to the bathroom where we spent the next 20 minutes. We then finished our date, and I took her to school. Most of our time consisted of just being with each other. Conversation with a five-year-old can be tricky at times, but one thing I know: Juliette knows I'm there, and she hears what I say. I asked, "Juliette, do you know what I like about you?" She responded with, "What?" I said, "Everything! I like everything about you." She then smiled from ear to ear. Why is all of this important? Because I like being with her, and I'm guarding and stewarding her heart. Above all else, guard your heart, for it is the wellspring of life (Proverbs 4:23). One of the most critical responsibilities I have as a father is to guard and protect the hearts of my son, daughters, and wife. I already feel the forces of darkness coming after the heart of my five-year-old daughter’s heart. The enemy is using culture to lie to her in subtle ways about God’s design for her. The battle is for her identity. The war is over what will fill up her heart. Even at age five my little "JuJu" wonders, "How much do you love me?" "How special am I?" "Are you pleased with me?” "Do you see me?" "Do you want to play with me?" I see the powers of darkness already coming after her through her dreams, cartoons, movies, school, the grocery store, and friendships. In the midst of all that, I want her heart to be filled up with my love, my words, and my affirmation. I want to guard her heart from the counterfeit identity that this culture wants to put on her. So what does this look like in the life of my daughter? How do I guard her heart? By being with her—sitting at the coffee shop, wrestling on the bed, or spending 20 minutes in the bathroom with her—I ’m telling her that she is important. I'm telling her that I love everything about her. I'm the one telling her who she is. I'm the one placing value on her life. I, her father, am the one filling her heart with pure love. Recently I was reminded that I'm the closest thing in representing God as a Father to my daughters. One night before bed I asked, "Juliette, do you ever hear God speak to you?" She said without hesitation, "Well, yeah." I then asked, "What is He saying?" She responded, "He is saying what you are saying." Whatever I speak to her is very important. The tongue holds the power of life and death (Proverbs 18:21). And in terms of spiritual warfare, being with Juliette is just as important and powerful as me praying for her in my prayer closet or worshipping for her in the front of the church. My time with her fills her heart with her true identity as a beloved daughter. She doesn’t have to listen to the lies of culture since her heart is already full.